Luno is an online wallet provider and Bitcoin exchange. Founded in South Africa, the company’s headquarters are now in Singapore and their operations also stretch into countries like Indonesia, Malaysia, Nigeria and the United Kingdom. Luno’s products and services aim to make it safe and easy for people and businesses to store, buy, use and learn about digital currencies. We chatted to data scientist Gorden Jemwa about the data tools Luno relies on and how data impact business decisions. Working in a data driven business means that every decision needs to be backed by data. Selling this idea to teams that don’t naturally work with numbers is not an easy feat, however: “It’s a new thing and when most people hear the word data, they think of analysis, and when they think of analysis, they think of mathematics and statistics and get scared,” Gorden says. That’s why his role as the head of a three-person data science team has two main elements: 1) driving the technical side of making data usable in all business units and 2) ensuring that the entire organisation develops the necessary kind of behaviours and mindsets to actually derive value from the data. These workshops have helped to shift the data conversation dramatically. “People are actually bringing their questions and we’re having a conversation, a data dialogue,” Gorden says. A comprehensive daily data email that gets sent to the entire company. This keeps everyone updated on the key metric (monthly active users). Dashboards in every office to show the key metrics of each team. These update every 15 minutes. Weekly meetings with the product team to deep dive into the key metrics. 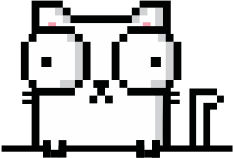 Monthly email updates to the entire company. Because every single team’s actions affect the key metrics, the analysis needs to be top of mind. This email gives those staff members insights that can’t be in the weekly insight meetings. Putting a tool like Looker to good use requires continuous and concerted effort from many parts of a team. In Luno’s case, it has helped to gain a better understanding of their active users and the conversion rates throughout their product funnel. Using Looker to keep an eye on the numbers, Gorden asked himself whether Luno was actually growing its active user base or whether customers were dropping off after a few months. That’s why he split the monthly active users view into cohorts. “Through this granular view, we saw that our retention efforts were not as good as we thought because it was only new users coming in that would do one or two transactions and then leave.” The customers simply didn’t have the attachment to the product that Luno wanted them to develop. In response to this realisation, Luno’s team started coming up with retention campaigns. For this, they started looking at “focus spots”: “We have built customer segmentation logic into Looker that clusters customers into distinct groups with specific transactional behaviours, or ‘profiles’,” Gorden explains. These help the team to figure out what drives customers’ behaviour. From a product perspective, Gorden and the team developed certain experiments to AB test where in the process of navigating the product they lost their users. They discovered two interesting things about their users: First, it seemed that customers in emerging markets use the product more for remittance and less to hold the value of Bitcoin for a long time. Secondly, South African customers don’t really sell Bitcoin, they hold it, which acts as a trust indicator for Luno. 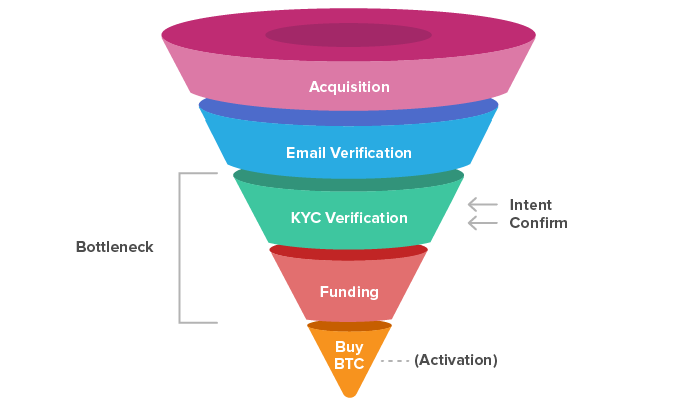 Tracking conversion rates across each stage of the funnel helps Luno to improve their user onboarding process - from signing up, getting verified and funding their account to eventually buying Bitcoin. They do this on a continuous basis, following the framework of John Boyd’s OODA loop decision cycle - observe, orient, decide and act. Specifically, they go through the following stages: problem identification, exploring the solution space, framing a hypothesis, designing a solution, prototyping, validating the design with testing and rolling out the solution. 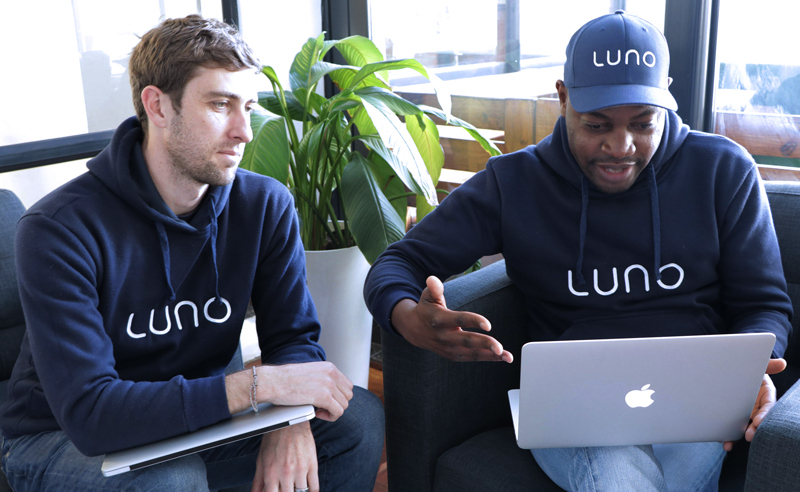 Looking at Luno’s funnel, there are quite a few places where customers can drop off: People sign up for an account, verify that they own the email address they used and go through an additional identity verification, the “Know Your Customer” or KYC queue. After that, they need to show intent of buying Bitcoin through depositing money into their wallet to then finally buy Bitcoin through Luno’s platform. “Starting with 100 people who are showing interest in Bitcoin, you might end up getting less than 5% actually buying,” Gorden says. 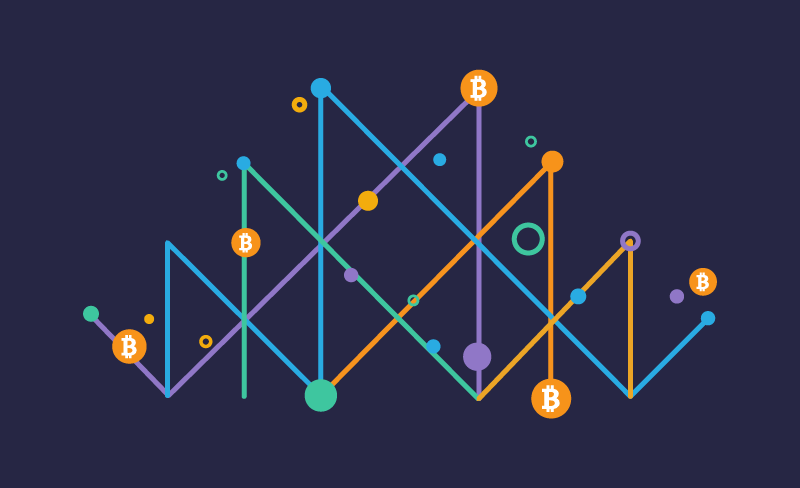 For most people, digital currencies are unchartered territory. That’s why gradually building confidence in the product as customers go through the funnel is so important. Tracking the time between the different stages in Looker, the team realised that the last two stages don’t have a big drop off, whereas a lot of people jumped ship between verifying their accounts and putting in the required funds. At that point, however, they couldn’t yet tell what was causing this drop-off. “At that point, it would have been easy to assume that customers value their privacy and are perhaps not comfortable sharing their true identity details with a party they do not trust,” he says. “However, we did not believe this to be the case, and were convinced there were other product-related or process issues that we could improve.” After exploring ways to do this, the team agreed to simplify the KYC verification process by introducing a “minimum viable wallet” that would be available for customers meeting certain requirements, with full functionality requiring manual verification. 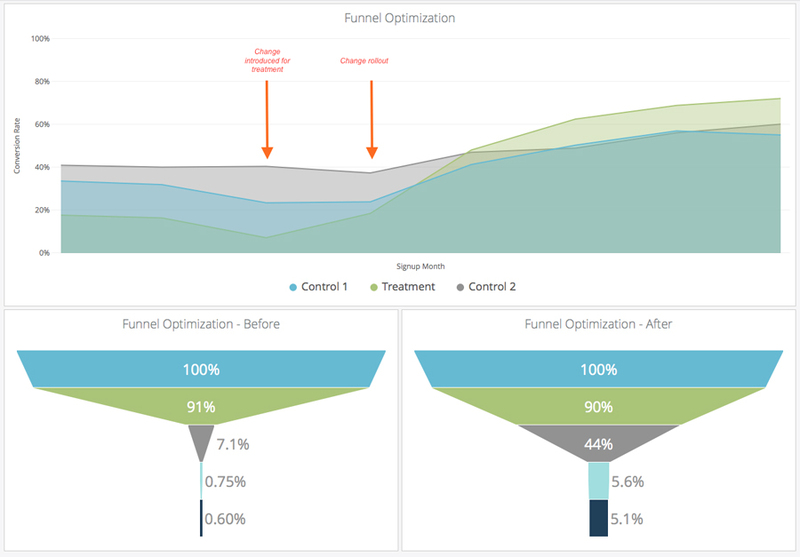 The figures above illustrate the impact the change had on the conversion rate for that stage of the funnel (top) after introducing the change. The overall impact across the funnel is depicted in the bottom figures. It shows an improvement from 7.1% to 44% on the sign up to KYC verification conversion rate, which resulted in an uplift from 0.6% to 5.1% across the entire funnel. The team also started segmenting the drop-offs into the different markets they operate in to understand this behaviour. Because certain banks don’t relay transaction information in the ways needed (because Bitcoin transactions need to map a deposit to a specific user ID), Luno had to go back and try to help them improve their processes. In addition, the team tried to figure out a way to measure their customers’ intent and actual acting on said intent to deposit funds. Communication around new Looker features and insights is a big factor and a challenge, Gorden admits: “Someone in our Finance team came to me a few weeks ago and was so surprised that we actually have a model that projects revenue in Looker.” The dashboard had already been there for the past six months and now shows on Pieter’s office monitor because it makes his life a whole lot easier. To address these communication gaps, Luno has started consolidating all data assets onto a Wiki. In addition, the team has created a dedicated data channel on Slack to not only help the rest of the company understand data better but also share the latest outputs with the entire business. One example is whether utility (Bitcoin is the only payment method available to that customer) or investment (does the customer hope the price will be more in future) are driving a customer’s use of digital currencies. The data might show similar behavioural patterns for both. That’s why Gorden believes that understanding human dynamics or behavioural economics becomes important to correctly interpret patterns in data - and maybe Looker is not the tool for that.